He succeeded a legend and then became one himself. 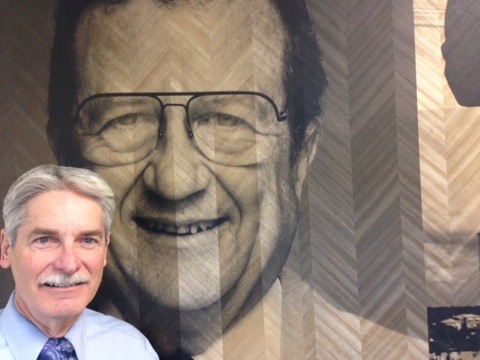 From Harold Taft to David Finfrock -- and the list doesn’t go on and on. 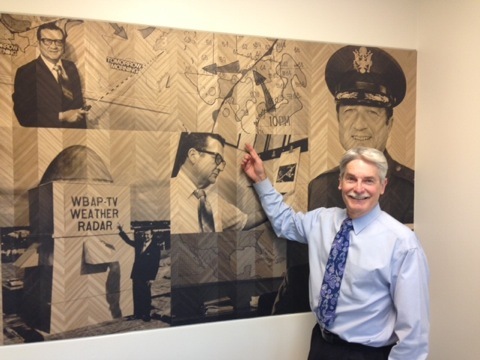 They have been the only two chief meteorologists in the 70-year history of KXAS-TV (which began as WBAP-TV and now is promoted as NBC5). As of Thursday, Feb. 1st, that will change. Finfrock isn’t leaving, but he’s cutting back to a part-time forecaster who will work roughly 100 days a year on a pay-per-day basis. The new chief is Rick Mitchell, who joined NBC5 in August 2012 and has been the weekday 10 p.m. meteorologist ever since. Finfrock, who turns 65 in May, says “it’s the best of both worlds for me” and a voluntary move that meets his goals of having more time off while also staying in the game. He signed his last long-term deal in 2012 and it was set to expire on June 1st of this year. But Finfrock says he opted for a Dec. 31 “retirement” due to imminent changes in the station’s health insurance provisions that would have affected his wife of 40 years, Shari Finfrock. In what so far is “kind of a handshake deal,” Finfrock is “more likely to be in” on Wednesdays through Fridays. But if bad weather hits, he’ll pitch in on other days. Because of a long-planned vacation trip, he’ll also miss most of the month of November. “If everything goes well, it’ll probably be the same situation next year,” he says. Until the early 1980s, Taft and Finfrock stuck to what now seems like a stone age approach. They hand-drew their maps for each newscast. There was one for Texas, another for the U.S. and a third “forecast map.” Temperatures were posted with a Marks-A-Lot pen just before the weather segment began, with Finfrock hurrying to a teletype machine to get the latest highs and lows. Taft, who was an Army officer during World War II, often acted as though he was still in uniform. Yes was “Affirmative,” No was “Negative,” and he went “on leave,” not vacation. So how did Finfrock, “extraordinarily shy” as a young man, and the stern, imposing Taft hook up in the first place? It’s still quite a story. Finfrock, who grew up in Houston, graduated from Texas A&M in May 1975 with a bachelor of science degree in meteorology. He then spent the summer in Juneau, Alaska, doing field research in geology, geophysics and meteorology. A full fellowship for graduate studies awaited him at Texas A&M, where he resumed studies that fall. Then came a phone call from someone “I never heard of.” It was Taft. He’d been looking at various job applications on public file at the National Weather Service’s southern regional office in Fort Worth. Finfrock caught his eye -- along with a number of other applicants. Would he like to audition at KXAS? The KXAS audition didn’t go well -- or so Finfrock thought. 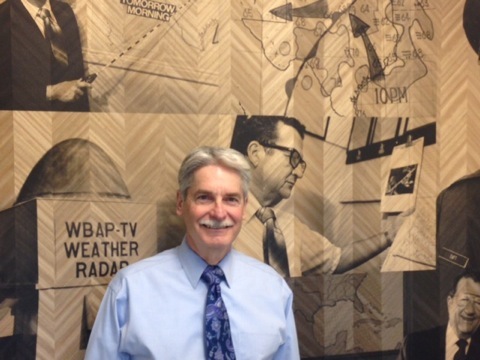 Initially seated at an anchor desk on a raised platform about six inches high, he was required to stand up and walk a short distance to the “weather wall.” When Finfrock arose and pushed the chair back, it toppled off the platform, making a “tremendous crashing sound.” Finfrock stayed on his feet and did the segment. But at that instant, he figured he’d blown it. Taft chose him anyway, and a couple of years later, Finfrock asked him why. Taft told him he was impressed with how the kid reacted calmly to a little duress and “if you can smoothly handle that, you should be able to handle just about anything on the air.” Otherwise the applicants were pretty much even in their qualifications, Taft said. Finfrock then became chief meteorologist. By that time, hand-drawn weather maps were very much a blast from the past while new tools continued to make short-term forecasting more accurate than ever. For accuracy’s sake, Taft resisted doing more than a two-day forecast while rival stations were doing five-day predictions. A couple of years after his death, Finfrock joined in the five-day outlooks, which now have expanded to 10 days. The latter two or three days are “more guidance than anything else,” he concedes. But “we do a whole lot better than we did before” with 48-hour forecasts, which seldom miss anymore. Finfrock says that climate change basically is an undeniable reality, with the last three years getting progressively warmer. What seems to be an increasing frequency of heavier storms is also “something we ought to get our hands on,” he says. Finfrock continues to relish the great outdoors, finding it boring to exercise on a treadmill. He’d much rather cut brush and split firewood on the Finfrocks’ 100-acre ranch, which they own in addition to their main home. “That’s how I stay in shape, not only physically but mentally,” he says. David and Shari have two children, Jennifer, 44, and Ryan, 39. He met his wife in Fort Worth, which never would have happened had Taft not called him and changed his career path in ways that Finfrock never imagined. They remain interlocked, disparate in personalities but dedicated to the cause of presenting the weather without any artificial breeziness. Taft’s tutelage is ingrained, and it’s still evident that Finfrock would never want to disappoint him. Sunday night’s message-heavy, rap-infused 60th annual Grammy Awards ended up being a major turnoff in the D-FW Nielsens. Now vying with the Oscars to become television’s longest awards show, the 3 hour, 35 minute telecast on CBS averaged 455,814 total viewers and 202,839 in the advertiser-coveted 18-to-49-year-old demographic. Those are mega-drops from last year’s show, which drew 661,670 total viewers and 288,639 in the 18-to-49 age range. Both were slight audience increases from the 2016 Grammys (658,663 total viewers and 285,813 in the 18-to-49 realm). Nationally, the 19.8 million total viewers for the Grammys were the lowest since 2009, when 19.04 million watched the show. Last year’s Grammys drew 26.05 million viewers nationally. That show was dominated by Adele’s big showing while Sunday night’s Grammys were a major category victory march for Bruno Mars. The last two telecasts have been hosted by James Cordon. Earlier Sunday, ABC’s portion of the NFL’s Pro Bowl (also shown on ESPN) easily beat the competing NHL All-star game on NBC by a score of 128,198 total viewers to 35,611. ESPN chipped in with an extra 71,221 viewers. On Friday, Fox4’s 9 p.m. local newscast led all prime-time programming with 178,053 total viewers while tying a repeat of Fox’s preceding The Resident for first among 18-to-49-year-olds with 34,327. TEGNA8 won at 10 p.m. in total viewers and tied Fox4 for the lead with 25-to-54-year-olds (main advertiser target audience for news programming). Fox4 as usual/always swept the 6 a.m. competitions while the 6 p.m. golds were split by Fox4 in total viewers and NBC5 with 25-to-54-year-olds. The prime-time pie got split four ways Thursday, with CBS getting the biggest portion while ABC and NBC got little tastes. CBS’ The Big Bang Theory as usual ranked as the night’s biggest scorer, both in total D-FW viewers (391,716) and among advertiser-craved 18-to-49-year-olds (109,221). The network’s Young Sheldon, Mom and Life In Pieces also won in total viewers from 7:30 to 9 p.m. The second half of ABC’s Grey Anatomy snuck in for an 18-to-49 win from 7:30 to 8 p.m. And NBC’s Will & Grace pulled in the most 18-to-49-year-olds from 8 to 8:30 p.m. before Life In Pieces trampolined upward to win on that scorecard from 8:30 to 9 p.m.
After again getting little help from Fox’s two-hour chunk of The Four: Battle for Stardom, Fox4’s 9 p.m. newscast rebounded to comfortably win at that hour in both ratings measurements. The news had more than twice as many 18-to-49-year-olds -- 84,256 -- as The Four (40,568). TEGNA8 ran first at 10 p.m. in total viewers while Fox4 was tops with 25-to-54-year-olds (main advertiser target audience for news programming). Fox4 notched another pair of 6 a.m. wins and NBC5 ran the table at 5 p.m. The 6 p.m. firsts went to CBS11 in total viewers and the Peacock among 25-to-54-year-olds. NBC’s one-two Tuesday punch of Ellen’s Game of Games and This Is Us dominated before Fox4’s 9 p.m. local newscast capped the night with a two-pronged win. Game of Games drew a nice-sized 292,006 D-FW viewers in the 7 p.m. hour, nearly equaling the following This Is Us (299,128). Both also won their time slots among advertiser-coveted 18-to-49-year-olds, with Game of Games pulling in 102,980 before This Is Us had 134,186. Fox4’s news then won at 9 p.m. with 227,907 total viewers and 59,291 in the 18-to-49 age range. It helped that CBS punted with wall-to-wall reruns of its usually formidable drama lineup. The CW’s 8 p.m. premiere of the DC Comics superhero drama Black Lightning settled for a light sprinkle in these parts. It drew just 28,488 total viewers and 9,362 in the 18-to-49 realm. ABC’s 9 p.m. entry, Kevin (Probably) Saves the World, won’t have to worry about that much longer. It ran last at that hour among the Big Four broadcast networks in both total viewers (64,099) and 18-to-49ers (12,482). CBS11 nipped NBC5 for the most total viewers at 10 p.m., but the Peacock won with 25-to-54-year-olds (main advertiser target audience for news programming). The 6 a.m. ratings were notably inflated with extra viewers who wondered about street conditions and possible school closings. Fox4 as usual had twin wins, luring more total viewers and 25-to-54-year-olds than its newscasts at 5, 6 or 10 p.m. The 25-to-54 haul of 144,124 viewers was exceeded by only one other Tuesday TV attraction -- This Is Us with 173,537. Fox4 also won at 5 and 6 p.m. among 25-to-54-year-olds. NBC5 had the most total viewers at 5 p.m. and TEGNA8 took the 6 p.m. gold in that measurement. Kaley O’Kelley, CBS11’s weekday 5, 6 and 10 p.m. co-anchor since January 2015, is taking an extended leave of absence to have preventative surgery. O’Kelley, in a live Facebook chat Friday with co-anchor Doug Dunbar, said she’ll undergo a hysterectomy on Wednesday, Jan. 17th and likely will be off the air for four to six weeks. She managed to get the word out in the face of constant interjections from Dunbar, who obviously was well-meaning but became aggravatingly intrusive during an almost 17-minute video posted early Friday evening. O’Kelley noted that she had an ovarian cyst and both of her fallopian tubes removed a “couple of years ago” after a “cancer scare.” She had been experiencing back pain. Late last year, she was hit with “excruciating pain just before the holidays.” O’Kelley’s Scottsdale, Arizona-based doctor, who delivered both of her children, eventually recommended a hysterectomy after expressing “some serious concerns about what is happening,” she said. Later, Dunbar detailed the pain he experienced after his surgery for a hernia. “But yours is much bigger and broader obviously,” he conceded. In reality, though, Dunbar did much of the talking -- at the start, at the finish and in between. He even launched a competition about who would buy dinner before O’Kelley’s last 10 p.m. newscast for a while on Friday, Jan. 12th. O’Kelley said she can’t wait for it to be over. “Listen to your body. If you think something’s going on, go get checked,” she urged. CBS11’s Gilma Avalos will fill in during O’Kelley’s absence, she said. O’Kelley likely will miss the February “sweeps” ratings period, but it’s considered a throwaway because of NBC’s telecasts of the Winter Olympics during much of that month. So the timing at least is pretty optimum. All the best to O’Kelley for a successful procedure and a full recovery. A network’s work is never done. Latest case in point: Fox. Seeking a midseason toehold before the February start of the Winter Olympics on NBC, Fox launched three new series and fresh episodes of its iconic The X-Files during the first week of January. All four had second go-arounds this week. As previously posted in Tuesday’s snapshot, the new sitcom LA to Vegas is doing fairly well despite mostly scathing reviews. Now let’s take a look at the rest of ‘em. Fox is filling its two prime-time Thursday hours with The Four: Battle for Stardom, its answer to the loss of American Idol to ABC. It’s not going too well so far, particularly among advertiser-prized 18-to-49-year-olds. The Four drew a smallish 46,809 viewers in this key demographic. This was good enough to outdraw ABC’s 7 p.m. rerun of the game show Child Support, plus new episodes of NBC’s Will & Grace and Great News in the 9 p.m. hour, and CBS’ Life In Pieces from 8:30 to 9 p.m. The Four otherwise lost to CBS’ The Big Bang Theory, Young Sheldon and Mom; NBC’s Superstore and The Good Place; and narrowly to the first hour of ABC’s Truth and Lies: The Tonya Harding Story. The Four fared a bit better in the total viewer Nielsens, beating NBC’s entire sitcom lineup, Child Support and Life In Pieces by a sliver. Still, its 135,320 total viewers were a relative pittance compared to Fox’s bust-out new midseason hit. That would be Wednesday night’s 9-1-1, which led all prime-time programming with 242,151 total viewers while also ranking as the pacesetter with 71,774 viewers in the 18-to-49 realm. On the downside, though, midseason’s second new episode of The X-Files had just 99,709 total viewers in the 7 p.m. hour, with a paltry 24,965 in the 18-to-49 motherlode. That was good enough to beat only ABC’s 7:30 p.m. episode of Speechless in total viewers. In the 18-to-40 measurement, X-Files fared better than both Speechless and NBC’s competing The Blacklist. But another old-timer, CBS’ The Amazing Race, dominated the 7 p.m. hour and squashed X-Files with 192,297 total viewers and 59,291 within the 18-to-49 age range. Fox4’s 9 p.m. local news had a far better night than X-Files with time slot wins in both ratings measurements. Wednesday -- TEGNA8 impressively overcame a skimpy 9 p.m. lead-in from ABC’s The Match Game to win at 10 p.m. in both total viewers and with 25-to-54-year-olds (main advertiser target audience for news programming). Fox4 notched another pair of 6 a.m. wins and also was tops with 25-to-54-year-olds at 5 and 6 p.m. NBC drew the most total viewers at 5 p.m. and TEGNA8 ran first in that measurement at 6 p.m.
Thursday -- TEGNA8 again won in total viewers at 10 p.m., but was edged by Fox4 in the 25-to-54 demographic. Fox4 as usual ruled at 6 a.m. while NBC5 broomed its rivals with sweeps at both 5 and 6 p.m. Paced by the midseason resumption of This Is Us, NBC rolled with advertiser-prized 18-to-49-year-olds Tuesday night while also scoring well in the total viewers Nielsens. Us led all programming with 162,271 viewers in the key 18-to-49 demographic while the Peacock’s Ellen’s Game of Games and Chicago Med also won their time slots with respective counts of 106,100 and 68,653 viewers. CBS’ NCIS as usual topped all prime-time attractions in total viewers with 363,227 in the 7 p.m. hour. This Is Us won at 8 p.m. with 299,128 viewers before CBS’ NCIS: New Orleans and Chicago Med tied for first at 9 p.m. with 220,785 viewers each. Save for black-ish, ABC’s lineup ran last all night among the Big Four broadcast networks in both ratings measurements. Its biggest scorer, a 7 p.m. episode of The Middle, had 142,442 total viewers and 46,809 in the 18-to-49 realm. black-ish ran third at 8 p.m. with 18-to-49-year-olds, outpointing the first half hour of CBS’ Bull. Episode 2 of Fox’s LA to Vegas ran third at 8 p.m. in total viewers and second among 18-to-49ers. It drew more viewers in both barometers than any show on ABC and did better among 18-to-49-year-olds than any show on CBS. So Fox has to be pretty pleased after the airborne comedy got mostly negative reviews. Fox4 continued its long run of prosperity at 6 a.m. with twin wins and also ran first at 5 and 6 p.m. with 25-to-54-year-olds. NBC5 won in total viewers at 5 p.m. and TEGNA8 was tops in that measurement at 6 p.m.
Sunday’s empowerment-charged Golden Globes awards on NBC turned out to be a turnoff for some but also rose up among advertiser-prized 18-to-49-year-olds in the D-FW Nielsens. Running from 7 to 10:08 p.m. and trumpeting the Time’s Up movement both visually and vocally, the Globes averaged 491,425 viewers, compared to 581,688 for last year’s ceremony. But there was a bit of a bump-up with 18-to-49-year-olds, from 205,254 last year to 224,683 Sunday night. This year’s Globes also evidenced a gender gap among D-FW viewers. The telecast drew 136,164 women in the 18-to-49 age range and 89,163 men in that demographic. One ratings result remained constant from last year. A preceding NFL playoff game on Fox again ended just before the Globes began and had a far bigger audience. The New Orleans Saints’ narrow win over the Carolina Panthers averaged 854,652 total viewers and 308,939 in the 18-to-49 realm. Also of note: From 6 to 7 p.m., when the game aired opposite NBC’s one-hour red carpet pre-Globes show, 117,164 women in the 18-to-49 age range watched football while 68,082 viewed the Globes pre-gamer. Among men in that audience demographic, 259,804 chose the closing hour of football while just 29,209 were tuned to the red carpet show. Earlier Sunday, even CBS’ stultifying Jacksonville Jaguars-Buffalo Bills playoff game drew more total viewers than the Globes. The Jags’ 10-3 win had 598,256 viewers and 209,080 in the 18-to-49 domain. Saturday’s pair of NFL playoff games were led by the Atlanta Falcons-Los Angeles Rams matchup in prime-time on NBC. It averaged 527,035 total viewers and 205,960 in the 18-to-49 demographic. In Friday’s prime-time ratings, the regular CBS lineup of MacGyver, Hawaii Five-0 and Blue Bloods dominated from start to stop in total viewers. NBC’s competing U.S. figure skating competition beat MacGyver and Blue Bloods among 18-to-49-year-olds but lost the 8 p.m. hour to Hawaii Five-0. Fox4 swept the 6 a.m. races and NBC5 did likewise at 6 p.m. The 5 p.m. golds went to NBC5 in total viewers and Fox4 with 25-to-54-year-olds. Just a night after blasting off with impressive ratings for its new 9-1-1 drama series, Fox had a failure to launch with yet another singing competition -- The Four: Battle For Stardom. Hoping to make up for the loss of American Idol, Fox instead was thrown for a big loss in D-FW. The Four’s 7 to 9 p.m. premiere drew just 92,587 total viewers and 34,327 in the advertiser-prized 18-to-49-year-old age range. In the Big Four broadcast network universe, The Four outdrew only ABC’s 7 to 8 p.m. reruns of The Middle and American Housewife in these two key ratings measurements. CBS’ 7 p.m. new episode of The Big Bang Theory as usual ranked as Thursday’s biggest draw in both total viewers (455,814) and 18-to-49ers (109,221). The Big Bang spinoff, Young Sheldon, also again held up well with 384,593 total viewers and 78,015 in the 18-to-49 realm. ABC’s two-hour Truth & Lies: Waco, the latest rehash of the David Koresh cult massacre, averaged 142,442 total viewers in the 8 to 10 p.m. slot, with 49,930 in the 18-to-49 motherlode. CBS’ S.W.A.T. won the 9 p.m. hour in total viewers (192,297) while the second half of Waco and NBC’s Chicago Fire were tops with 18-to-49-year-olds (53,050 viewers apiece). TEGNA8 scored twin wins at 10 p.m. in total viewers and with 25-to-54-year-olds (main advertiser target audience for news programming). 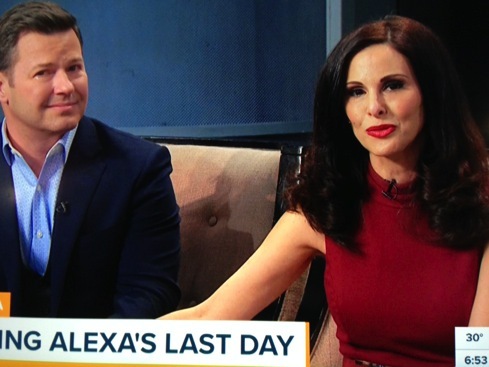 At 6 a.m., co-anchor Alexa Conomos’ last day on TEGNA8’s Daybreak, after 15 years with the program, couldn’t deter frontrunner Fox4 from another sweep. Daybreak ran second in total viewers and third with 25-to-54-year-olds (behind runner-up NBC5). NBC5 otherwise enjoyed the early evening with doubleheader wins at both 5 and 6 p.m.
Alexa Conomos officially called it a day on Thursday’s Daybreak, ending a 15-year tenure with TEGNA8’s waker upper. She profusely thanked colleagues and viewers for being her surrogate families. Conomos otherwise is leaving both Daybreak and the station in favor of a “work-life balance” for herself, her husband and their three young children. 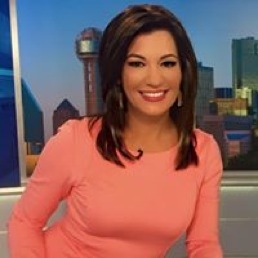 Conomos joined Daybreak in 2002 as the program’s traffic anchor before becoming co-news anchor with Ron Corning in June 2014 after regularly filling in. She originally announced her decision to leave in January 2017, but repeatedly was persuaded by station management to stay on while a replacement was sought. In late November, the station finally named Kara Sewell from Cincinnati’s WXIX-TV to join Corning at the Daybreak anchor desk. He said she’ll be introduced to viewers on the Friday, Jan. 5th edition of Daybreak. On her last day, Conomos was showered with affection and a highlight package of mostly goofy moments, including her mispronunciation of Fort Worth’s Mayfest as “Mayfart” during a memorable 2011 traffic segment. In her closing remarks, before being joined by her family, Conomos urged viewers to look at her Facebook page for news of what she’ll be up to next. That would be Anderson Conomos Homes, a newly formed “real estate consultation” firm. Dallas-based WFAA-TV (TEGNA8) begins the new year with a change at the top. The station’s corporate owner, TEGNA, Inc. of McLean, VA,, announced Thursday that Brad Ramsey will succeed Mike Devlin as president and general manager. Devlin, who earlier had announced his retirement after 12 years in management, will remain with TEGNA8 through early February to “ensure a smooth transition,” TEGNA says. 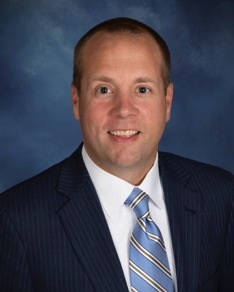 Ramsey has been vice president of business strategy for The Center for Sales Strategy after earlier serving as corporate TEGNA’s vice president of sales. Ramsey, who will relocate to Dallas, is a Virginia Tech graduate with a Bachelor of Arts degree and a Masters degree in business administration. Devlin earlier was a reporter for WFAA when it was home-owned owned by Belo Corp. He returned to the station in 2005 after serving as news director for Houston’s KHOU-TV. In the last major ratings “sweeps” period on his watch, TEGNA8 returned to the top spot last November in the showcase 10 p.m. newscast competition. The station won in both total viewers and 25-to-54-year-olds, the main advertiser target for news programming. TEGNA8 lately has placed a heavy emphasis on “engagement on all devices,” particularly during its early morning Daybreak program. Recently hired traffic anchor Demetria Obilor, who doubles on-air as a Twitter/Facebook/Instagram chronicler, spoke volumes in that respect Thursday morning with a Twitter post and accompanying picture in which she assured followers, “Man, I’m tryna kick it wit ya.” Obilor at last count has 107,511 followers on Twitter. Local Nielsen ratings snapshot (Fri.-Tues., Dec. 20-Jan. 2) -- catching up on Cowboys, college football playoffs, etc. The Dallas Cowboys’ meaningless, dull-edged New Year’s Eve win avoided at least one further indignity. For the record, Dallas’ first string beat the playoff-bound Philadelphia Eagles’ second string by a 6-0 score. It ended the Cowboys’ season with a 9-7 record that wasn’t good enough to make the NFL’s annual tournament. But likely helped by frigid, stay-at-home temperatures, the noon-starter on Fox at least avoided drawing the smallest D-FW crowd of the year. The game averaged 947,239 viewers to rank a bit ahead of the 904,507 viewers for the Dec. 10th win against the New York Giants. In the advertiser-prized 18-to-49-year-old demographic, though, the Cowboys easily hit a season low of just 262,130 viewers. The aforementioned second Cowboys-Giants game dropped to second place in those dubious standings. It drew 321,422 viewers in the 18-to-49 realm. Happy New Year, Jerry Jones. Let’s move on to Monday’s pair of college football playoff games, one an instant classic the other one pretty drab. Both were carried on ESPN. Georgia’s elongated double overtime 54-48 comeback win over Oklahoma was first in line, running from 4 to 8:17 p.m. Let’s get the hand calculator out. Georgia-Oklahoma averaged 776,309 total viewers and 318,301 in the 18-to-49 age range. Yes, that’s more viewers in this key demographic than Cowboys-Eagles had. Alabama’s following 24-6 suffocation of Clemson was bumped to ESPN2 for the first 22 minutes before shifting over to the mothership. It dragged on until 11:20 p.m., pulling in 470,059 total viewers and 202,839 within the 18-to-49 motherlode. Toggling back to New Year’s Eve, ABC’s late nighter easy drew the most total viewers, peaking at a total viewers crowd of 747, 821 between 11 and 11:15 p.m. when the Eastern time ball dropped in Times Square. On Tuesday night, Fox rolled out the 8 p.m. premiere of its new comedy series LA to Vegas. It drew 163,808 total viewers and 46,809 of the 18-to-49 persuasion. CBS’ Bull was the time slot winner in total viewers (341,861) while NBC’s Ellen Degeneres-hosted Game of Games won with 18-to-49-year-olds (102,980 for the full 8 to 9 p.m. hour). LA to Vegas ranked third in each measurement from 8 to 8:30 p.m. Here are the Friday and Tuesday local news derby results, with all four stations taking a Monday holiday exemption. Friday -- TEGNA8 ranked first at 10 p.m. in total viewers while Fox4 won among 25-to-54-year-olds (main advertiser target audience for news programming). Fox4 kept rolling at 6 a.m. with twin wins and NBC5 swept the early evening races with across the board wins at both 5 and 6 p.m.
Tuesday -- TEGNA8 repeated as the 10 p.m. winner in total viewers and also was tops with 25-to-54-year-olds. Fox4 as usual swept the 6 a.m. competitions and added 5 and 6 p.m. firsts with 25-to-54-year-olds. TEGNA8 drew the most total viewers at both 5 and 6 p.m.
Dallas-based Fox4 begins the new year with a new hire. He’s Alberto Romero, who on Jan. 8th will be joining incumbent meteorologists Dan Henry, Evan Andrews, Ali Turiano and Jen Myers. Romero, previously with CBS affiliate KYTX-TV in Tyler, TX, will “report the weather on various newscasts and across our digital platforms,” Fox4 said in a publicity release Tuesday. Before his stint with KYTX and earlier with the now defunct Texas Cable News network, Romero spent eight years with the Air Force as a staff sergeant and weather officer. 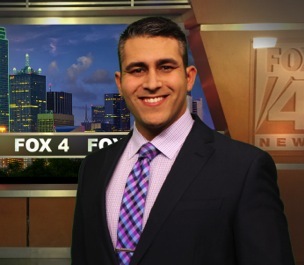 “Alberto’s field military experience -- being able to quickly and accurately assess weather conditions -- will be an asset to the Fox4 team and to our viewers,” vice president and news director Robin Whitmeyer said in a statement. Romero is a graduate of Mississippi State University with a degree in Geoscience.